This guest post was contributed by Dr. Matthew Ingleby, Lecturer in Victorian Literature at Queen Mary, University of London. Over the last few decades, Our Mutual Friend has generated much scholarship about its spatial representation, not least Franco Moretti’s important intervention in Atlas of the European Novel 1800-1900 (1997). One of the many methodological innovations attempted by Moretti involves the sequential mapping of the represented space of the novel over the course of its succession of monthly numbers in serial publication. Instalment by instalment, Dickens’s city expands and becomes increasingly interrelated as the narrative progresses, the socially and geographically disparate places it encompasses becoming connected in ever more complex ways. Franco Moretti, Atlas of the European Novel 1800-1900 (Verso, 1997): Fig 58h. Our Mutual Friend, December 1864. 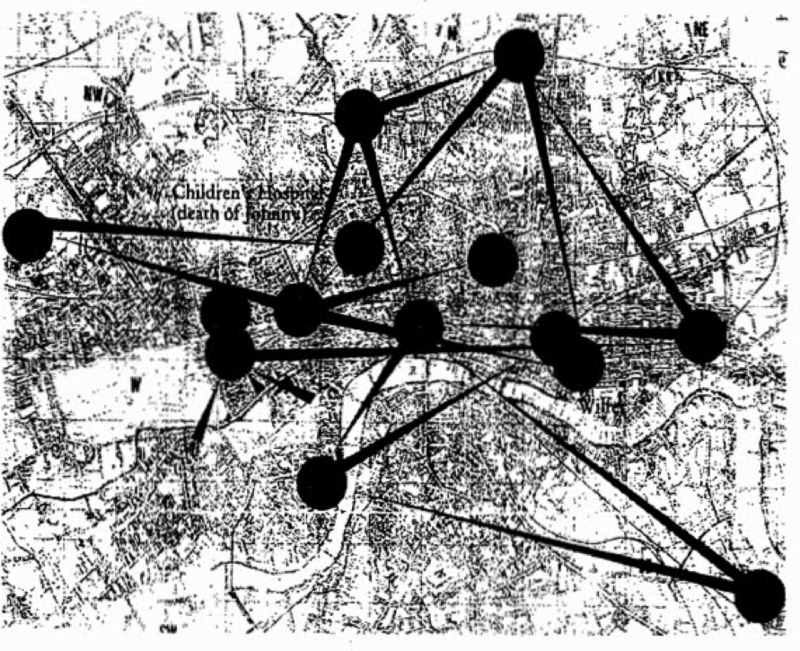 To demonstrate graphically the multiply networked quality of the cityscape the novel produces, Moretti superimposes onto a pre-existing contemporaneous map of the metropolis thick circular dots to indicate geographical settings and arrow-like rays emanating from them to indicate ‘meetings’ between them. Of the particular nature of these relations, Moretti tells us nothing, and intentionally so. His method deliberately generalizes, enabling a form of ‘distant reading’ to surface, in which the subtle differences our discipline trains us to elevate become strategically downplayed so that we can look afresh at what we think we already know. The glory, by contrast, of a slow reading project such as this present one is that we can complement Moretti’s radical mapping with another equally unusual form of readerly attention, observing at a local scale the terrain of a particular narrative instalment, to flesh out and characterize the spatial relations his maps flatten for the sake of clarity. Those dots and rays his literary cartographies include reward close analysis. Moretti’s monthly mapping project stops at the December 1864 number, which is a shame for us, because it would have been interesting to make use of his cartographic version of our current slice of Our Mutual Friend, first published in May 1865. This textual instalment, which contains an important encounter between the two heroines and a near run-in between the rivals for Lizzie’s affection, is also notable for the way it assembles a number of different kinds of spatial practice within and between the novel’s geographical sites, the writing of all of which raises questions of agency and class identity.